The Asics Kayano shoes have ben around for a number roof years now, so much so that the current version has the number 21. The shoe is designed for overpronators and has ample cushioning to provide comfort on long runs. I started using these shoes a few years ago and have happily used version 19, 20 and 21. The colour schemes are a very much a personal choice, me, I like them especially the orange. 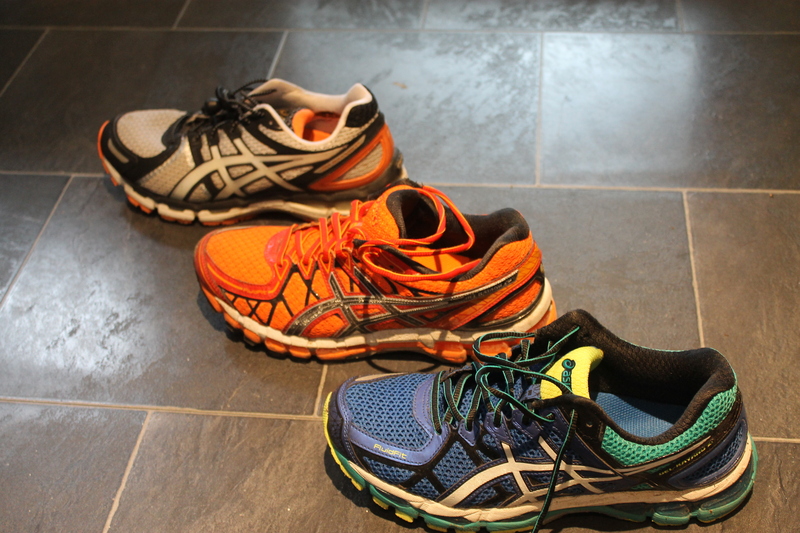 With all running shoes the big question is what are they like to run in? The good news is that the answer is simple, they are great. The comfort provided by the cushioning is very good, but then again there is a decent amount of it, not to the level of Hoka One One but still a decent amount. I have found the initial wearing in process can be a bit trying, as getting the lacing right to hold the foot stable and not get hot spots can take a few goes, but once that is sorted there are no other problems. The shoe for me is not as hard wearing as some other makes I have had, I find that within 500km not only is the comfort going, but I have worn a hole in the inside of the heel of the shoe. Now, I have to say that I do seem to do this to most makes of shoe I have owned, but with the Asics the breakdown in the cushioning and the hole do seem to appear earlier than with others. The price is a draw back with these shoes, they are pricey at full price, if you shop around you can get them discounted, but they are a high end shoe. In conclusion, do I like these shoes? Yes, would I recommend them, well if they suit your running style then yes, they do cost a bit but the comfort they provide is worth it. This book has been around for a few years now and I think it is fair to say has certainly become a conversation piece amongst both athletes (ahem) and coaches. The premise of the book is to explore whether elite athletes are more naturally talented or if they have done more purposeful practice, the book is centred around the belief that to become world class you need to have about 10000 hours of purposeful practice. In my house just the purchasing of the book prompted intense discussion between me and my boy, who said it is rubbish and was sick of having it’s principals told to him constantly during his school life. He has never read the book. I will be honest, when I am not good at a sport I am guilty of saying I am not a natural whatever, but having read the book and now understanding it more, what I should be saying is I am less practised at the sport and need to invest more time and purposeful practice to improve. The book quotes various studies throughout it’s course and uses these to back up the principal theory and the examples obviously are designed to suit the arguments, he does offer up the counter arguments but these are not explored in as much detail. I have to say I am not a complete convert to the theory, but the idea that purposeful practice designed to work on your weaknesses is better than practicing the things you are already good at is something I do agree with, and is something I am going to be incorporating into my swim training. Should you read the book, yes and then make your own mind up about whether you agree with his ideas or not. I know some coaches and school teachers who are complete converts and also I know people who are completely against the idea as they maintain the elite sportsman simply are more talented. For those of us who operate well below the elite level there is plenty in the book we can take and so I would say go read it, if nothing else it is certainly a conversation piece. I was introduced to the Lumie product range via the Joe Beer Podcast (well worth subscribing to) and decided to do some investigating into what they were supposed to do for you. From the Lumie website it says that these products are designed to help you wake up using light therapy to help stimulate production of hormones that help us to get up and go, while suppressing those that bring on sleep. Now for me up until last November I would never have considered one of these products as I had no problem waking up and feeling ready to go, then for some reason in November and for ho reason I can work out I just couldn’t get up in the morning, the alarm was waking me with a start and I generally didn’t want to go anywhere. At first I thought this would go, but as it carried on into January I decided I need to do something, the question was what. Having heard of these products I did some research and as they are relatively low in cost (approx £60) I decided to give it a go, I have to say I wasn’t holding out much hope, but try it and see. The product is dead easy to set up, I think it took about 5 minutes and so isn’t really worth going into more details, I am sure there are unboxing videos on YouTube if you want to see one. The proof of the pudding is in the eating as they , so what is the product like? Well, it is designed to increase the light in the room from 30 minutes before the alarm time to simulate a sumer morning, and I can confirm it certainly does that. But does it make you feel better when you wake up? For me I can say that after a few weeks use it is working, when my alarm goes off I am waken yup feeling relaxed and generally ready to go. This i know is not a very scientific result, it is purely subjective, I do however have a second test subject and someone who is frankly rubbish in the morning, my wife! First things first, my wife is a definite sufferer of SAD, and she has a lamp in her office to help her through the winter, and she also likes sleeping. So when I asked her what she felt about the light I was very surprised by her answer, I had expected her to say it didn’t help at all, but in fact it was the complete opposite, she says that it really is helping, she is waking feeling relaxed and not dreading getting up. The big question left for me on this is, is the effect real or is it a placebo effect? For the time being I would say it is real, as time goes on I will re-asses this and see if the results continue to be positive. In conclusion I would say that this product might help some people, it has helped me, is it worth the money? Yes, as at worse if the effect doesn’t work you get a nice bedside light with an inbuilt alarm clock. Could you replicate the effect with a timer switch on your bedroom light and have it increase the brightness over a period of time, no idea, try it and let em know the outcome. This review is the first one for this product, as I intend to do another one in the future to see how it is progressing. Here is the link to this actual product for those interested. As someone who is new to the world of triathlon, I decided a trip to the Triathlon Show at Sandown Park was probably a good idea. Before I went I checked out to see what seminars might be of interest and whilst there were several that looked ok it was only the SwimSmooth one that really grabbed my attention and so that was the one I would make an effort to attend. On arrival the parking was easy and only a couple of minutes walk to the exhibition centre, exchanging the e-ticket for an entrance band was simple and the offer of a free goody bag was too much to turn down! Now I know that when I have been to these types of shows in the past I seem to collect literature like it’s going out of fashion, so this time I promised myself I wouldn’t do it. The swimsmooth talk was early on, so I pretty much headed straight to the theatre to get a seat, the talk itself was extremely interesting. They went through a process of showing the similarities between different swimmers using video to illustrate the points. Without giving away all that they said I was very impressed and they talked in a language that was easy to understand, no jargon for the sake of it. After the lecture it was time to explore the stands, now as you can imagine every area of triathlon was covered and some areas I had never considered as well. I was fascinated to look at some of the training camps and coaching options available, it looks like your family holiday could be combined with a training camp, I wonder what my wife would say? Something I had never seen before up close was an endless pool, talking to the guys from the company that supplied them was interesting, yes they are quite expensive but the estimated running costs were no where near as much as I thought. You might by now be wondering how much kit did I buy, well here there are two answers, one is what I did actually buy and the other what would I have like to buy! I would have liked to have bought one of the weapon like cargo time trial bikes, some fancy Ascics running shows, a pile of clothing and a new kit bag. The reality was I bought a box of ZipVit energy bars, much cheaper! All in all it was an enjoyable time, it’s great to walk around and chat to people who sell the stuff you might want to use and to see their enthusiasm, whilst I am still some apprehensive about doing the triathlon, I think I like the people in the world of triathlon. 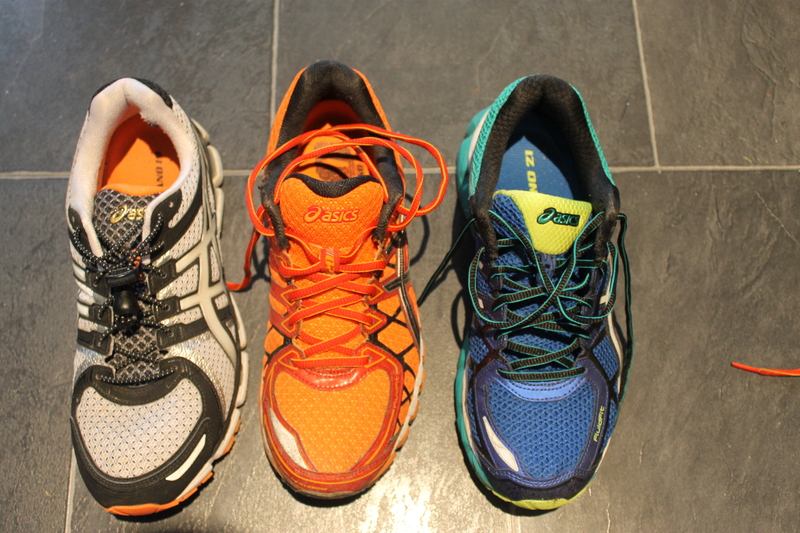 I will start this review by saying I have been a long term fan of Saucony running shoes, I have had many pairs, including Omni Progrid 8,9,10’s and I also bought these shoes myself so this is my opinion based on spending my own money. Tis review is also my initial review, as once I have used them more I will do another review. These shoes are a lighter model than my previous Omni’s and that was the main reason for their purchase, I wanted a faster shoe. The colour scheme are very much love or hate it seems, me I like the flash green, my boy thinks they are too bright! You have to make your own mind up. The fit, is lie that of other Saucony shoes I have owned in that they are very comfortable, and this pair had the added bonus of me not having to play around with the lacing to get them comfy. In use I have to say I really did notice how much lighter than my previous shoes they were, and this lightness did not mean less stability in fact I would say the stability was the same as the Omni’s. Having now done a straight run and a hill rep session in the shoes I can say that I am impressed, a fast(ish) light stability shoe. As I said at the start this review is only my initial thoughts and once they have been used more I will write another review. But so far I would say I am impressed. Here are the details of the new Mizuno Wave Evo shoes, if you decide to buy some, please let them know you read about them here. Over the last few years, there has been extensive research and testing carried out on running styles. There is speculation on whether there is an ‘optimum style’ in order to minimise injury risk and maximise efficiency. 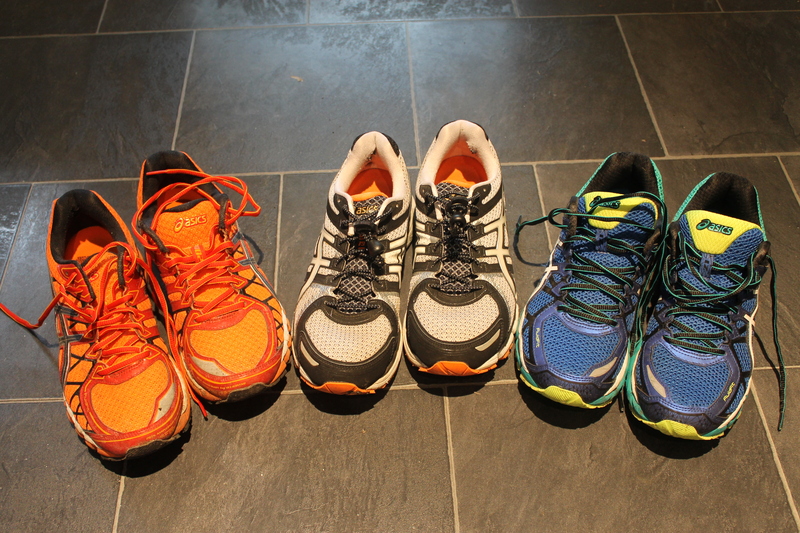 Until recently, running shoes have been evolving to provide cushioning and support. However due to recent research, trends are now taking a different direction, where the feet and body are allowed to work more naturally. With this increasing popularity of mid/forefoot running, Mizuno is set to launch an innovative masterpiece – the Wave EVO Cursoris. This is a running shoe that allows the foot to function more naturally, whilst still providing technologies in the shoe to help the runner and improve their midfoot running, particularly when they are first attempting a midfoot strike. Mid/forefoot striking is best achieved either with bare feet, or shoes with a flat midsole, allowing natural movement of the body and foot. 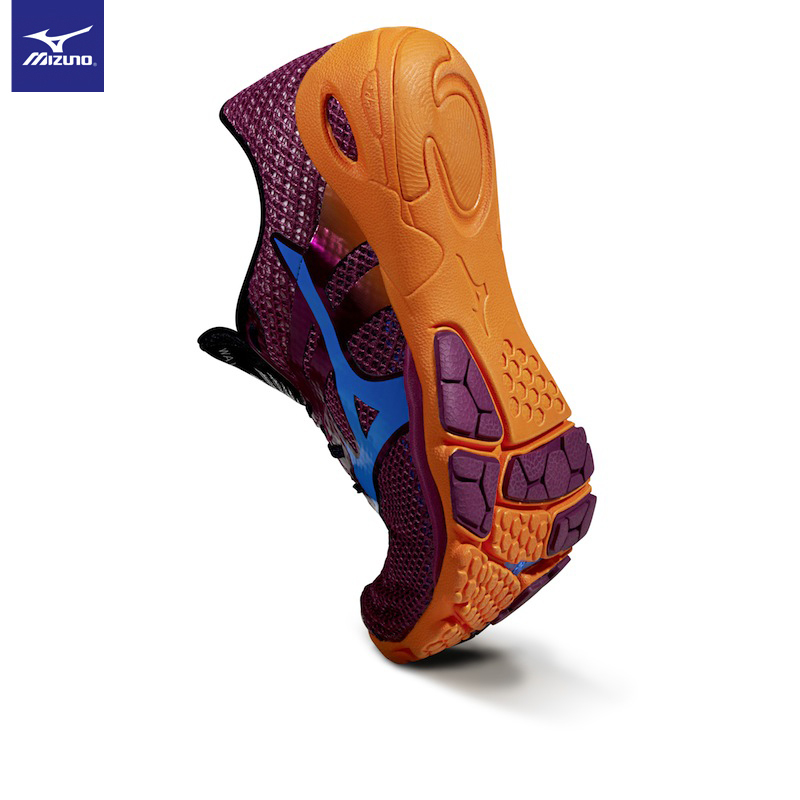 The Wave EVO Cursoris accommodates this with a zero drop midsole ramp from heel to toe. The midsole is 12mm ap+ cushioning foam, for moderate protection, and has deep multi directional flex grooves allowing for a more natural gait. 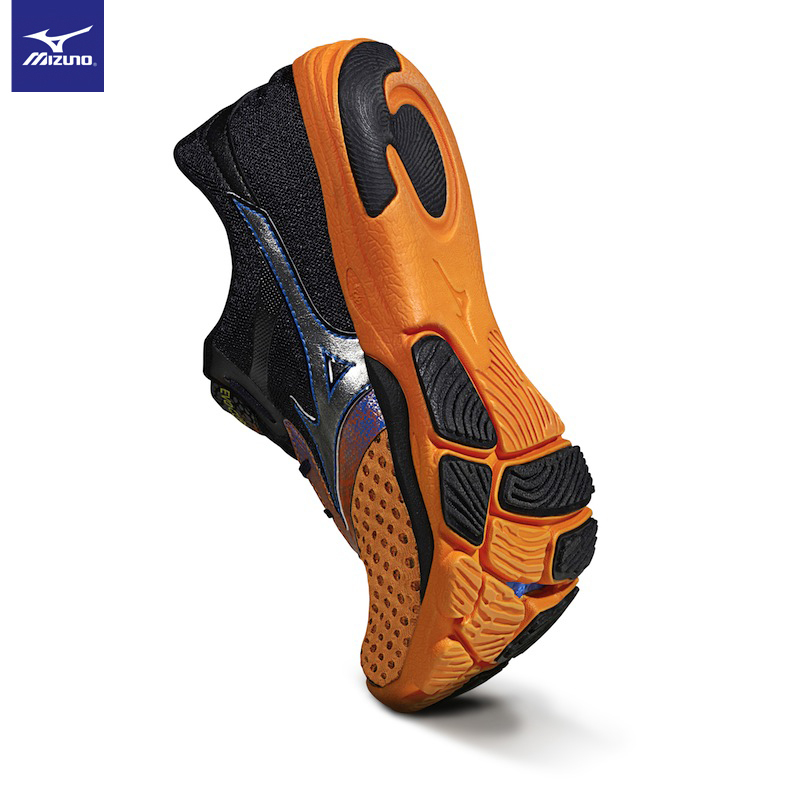 Mizuno’s unique EVO Wave technology is cleverly positioned in the mid-forefoot to provide a responsive cushioning and stability to aid the ride experience. Flat, light and flexible; the Wave EVO Cursoris is constructed with a wide forefoot to allow the toes to spread which helps naturally stabilise the body, while the midfoot offers a snug secure fit. The Wave EVO Cursoris is an ideal shoe for runners transitioning to mid/forefoot running efficiency. 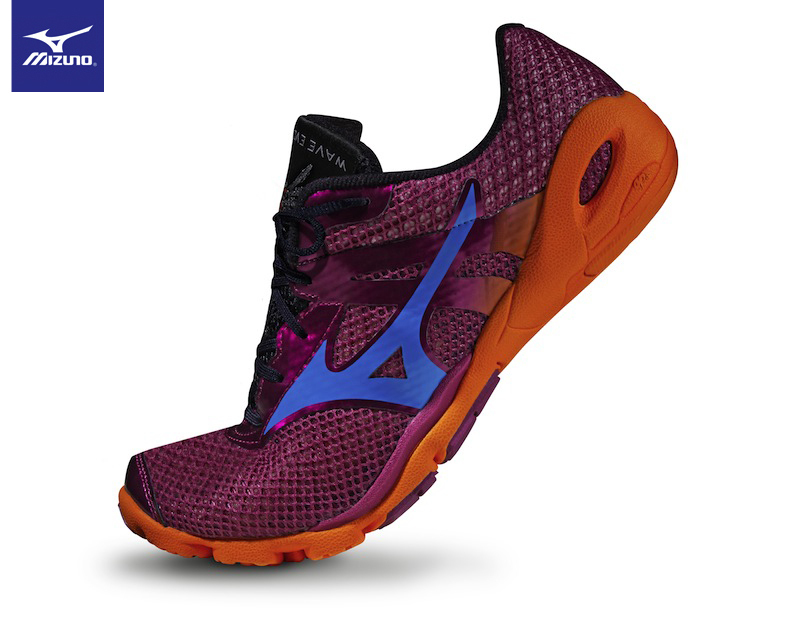 With this increasing popularity of mid/forefoot running, Mizuno is set to launch an innovative masterpiece – the Wave EVO Levitas. This is a running shoe that allows the foot to function more naturally, whilst still providing technologies to help the runner and improve their midfoot running. Mid/forefoot striking is best achieved either with bare feet, or shoes with a flat midsole, allowing natural movement of the body and foot. The Wave EVO Levitas accommodates this with a zero drop midsole ramp from heel to toe. The midsole is 8mm ap+ cushioning foam, for light protection, and has deep multi directional flex grooves allowing for a more natural gait. With the midsole 4mm thinner than that of the Wave EVO Curosis, the Wave EVO Levitas is also lighter and therefore ideal for those already running mid/forefoot or for lighter/faster runners tackling shorter distances. Flat, light and flexible; the Wave EVO Levitas is constructed with a wide forefoot to allow the toes to spread which helps naturally stabilise the body, while the midfoot offers a snug secure fit. The Wave EVO Levitas is an ideal shoe for midfoot runners, or runners who are transitioning to mid/forefoot running efficiency.